We went to the H Vazquez Circus last night and had a great time! The will be performing tonight and tomorrow night as well and I highly recommend going. It's one of the best circuses I've been to (and this includes Ringling). It's a one-ring circus, so you really get up close and personal and the acts are quite good. 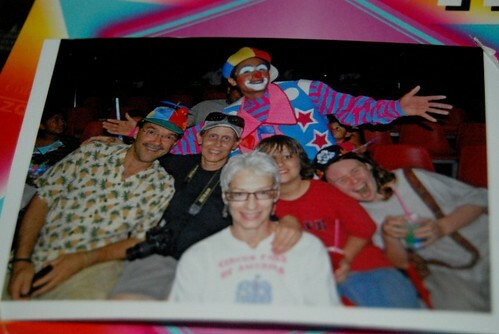 From top to bottom, left to right -- a Clown, Tom, Me, George, Moses, and Vicki. You guys look like you're having fun., and G especially looks happy. What a nice smile and gleam in his eye. Nice to see. You all look so happy! I bet it was a ton of fun.